Aleksey Krivoruchko (above) is Chief of Armaments and Deputy Minister of Defense of the Russian Federation (Russia). 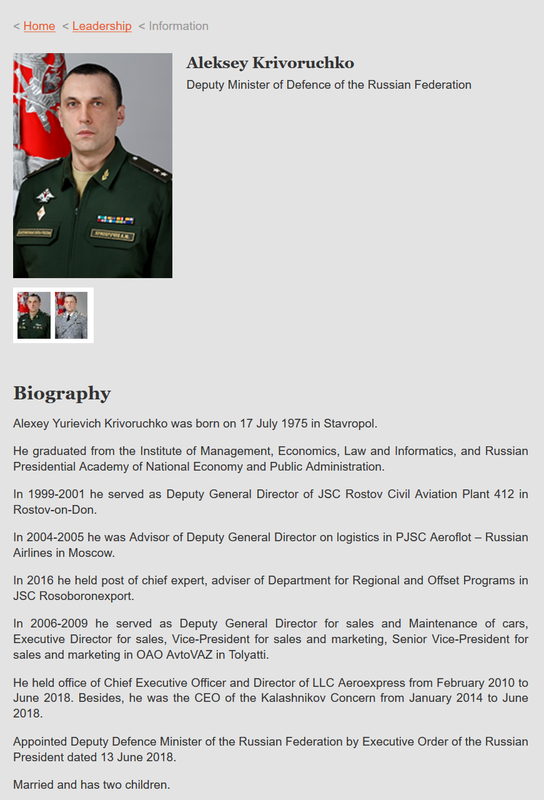 Aleksey (Alexey) Krivoruchko (cry vo RUSH ko) is Russia’s Chief of Armaments and Deputy Minister of Defense. He buys weapons for their military made in his factories. It is illegal for Russian products to be imported into the U.S. However, the Deputy Minister’s companies in Miami and Las Vegas can. They are shipped from his Russia factories in parts. His companies in Florida and Nevada assemble them. They are sold wholesale to gun dealers who sell them retail. How is Russia and Krivoruchko getting away with it? Here is one attempt at explaining his scheme. The Deputy Defense Minister owns 49 per cent of TransKomplektHolding LLC, the parent company of Kalashnikov Concern JSC. They make and sell weapons. In fact, according to their Russian website, Kalashnikov Concern and Transkomplekt Holding are the same companies. Both companies are based in Moscow, Russia. The majority share is owned by the Russian government and its President Vladimir Putin. Krivoruchko was the majority shareholder of Kalashnikov Concern in Russia, a weapons factory. Rostec owns 25 per cent. The Defense Minister owned 75 per cent of both companies until June 13th last year. The Russian Federation reported Krivoruchko sold his shares in Kalashnikov. It is also true that the Kalashnikov factory was transferred into a new corporate entity, TransKomplektHolding LLC, also known as TKH LLC. They are located in the same place, make the same products, and employees work at the same factory. The only thing new is the company name on their checks. The corporate transfer was made two months after Rep. Ted Deutch (FL-D) filed a complaint with the Treasury Department. In a letter dated April 11th last year, Deutch asked whether or not imported parts and components violated sanctions. The Treasury Department failed to respond. Alexey Krivoruchko was the majority owner and former Chief Executive Officer (CEO) of Kalashnikov USA in Boca Raton, Florida (Miami) until 2015. He transferred ownership to others. More importantly, does the Deputy Minister retain control? However, the Deputy Minister still owns and controls the New Frontier Armory LLC in Las Vegas, Nevada. It is owned by Stellcon USA LLC based in Tullytown, Pennsylvania. Their parent company, RWC USA LLC was created in Pennsylvania on March 17th, 2011 as the only dealer of Kalashnikov products in the U.S. The owner of RWC USA LLC? Their parent company is in Russia. It is called the Russian Weapons Company. With a properly drafted legal agreement, one can control a business without owning it. Sometimes it can be done with a wink or a handshake. Pointing a gun at someone’s head also gets the point across. Why spend money on legal fees? The first AK-47 automatic assault rifle was made by Kalashnikov in 1947. Kalashnikov manufactures and designs automatic and sniper combat weapons. Their product line includes guided artillery ammunition, and civilian products like shotguns and sporting rifles. Their products are sold in 24 countries. The Russia Weapons Company or RWC Group LLC, is based in Tullytown, a city in southeastern Pennsylvania. The Russians spell “Defense” with a “c” instead of an “s”. Shipping Russian goods to the U.S. is illegal because President Barack Obama banned them July 16th, 2014. Alexey Krivoruchko’s name was never placed on the sanctions list. To get around the ban, Kalashnikov ships their Russian-made weapons in pieces and parts from a Russian-owned factory in Bulgaria called Arsenal. When they are received in Pompano Beach, Florida (Miami) and Las Vegas, Nevada, they are assembled. Kalashnikov USA sells them wholesale to gun dealers who sell them retail. Before the ban, 80 per cent of Kalashnikov’s products were shipped to the U.S, according to Krivoruchko. Russian exports of weapons exceeded $50 billion last year said Rostec’s Director General Sergey Chemezov. They were $11 billion in 2011. Rostec is a government Russian-state holding company. It owns and controls every major industry in Russia . Confused? That is the idea. Kalashnikov weapons were first made in Houston, Texas in 2007. They are still shipped there. However, the weapon parts are assembled and modified in Las Vegas. New Frontier Armory has a 6,000 square foot facility there to do it. The warehouse in Pompano Beach, Florida is 40,000 square feet. The Las Vegas shooter bought his AK-47 legally from New Frontier Armory in Las Vegas. The Parkland High School shooter bought but never used an AK-47. The school is only 13 miles from the Kalashnikov gun assembly plant in Pompano Beach. Both locations are in Broward County, Florida. Debbie Wasserman Schultz represents parts of Florida’s Broward and Miami-Dade counties in Congress. She is Chief Deputy Whip of the Democratic Caucus. The Congressman also ran Hillary Clinton’s Campaign for President in 2008 and the Democratic National Committee (DNC) in 2016. On Dec. 24th, Christmas Eve, the Russian Weapons Group LLC in Pennsylvania, filed this three-page corporate document. It allows company officials to sell real estate in the name of RWC Group LLC. The company was formed March 17th, 2011. RWC’s attorney is Joshua M. Farber is its attorney. His offices are in Pittsburgh and Philadelphia. Mossberg became CEO on July 30th.